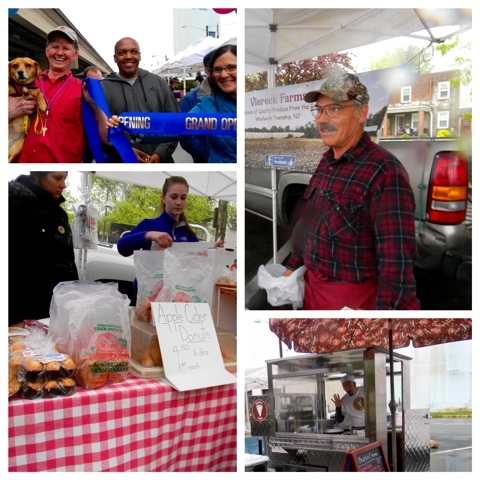 The 17th annual Collingswood Farmers' Market opened on Saturday, May 7, 2016. Despite the over-cast skies and more than occasional drizzle and downpours, the vendors and market goers were out in full force, happy to see each other. There were returning familiar vendors, such as Springdale Farms; Viereck Farms; DiBartolo's Bakery; Tree House Coffee Shop; Revolution Roasters (with a damn fine cup of decaf! ), Charlie's Crepes; The Tortilla Press; The Popcorn Kettle King, and many other wonderful purveyors of fresh foods. From Top left to right: Dave Hodges, Director of the C'wood Farmers' Mrkt, with Joe Njoroge, and Collingsood Commissioner, Joan Leonard; Les from Viereck Farms; Spingdale Farms; Charlie's Crepes. Cutting the opening day ribbon were many Friends of the Collingswood Farmers' Market - my neighbors, Bernie and Mary; Dave Hodges, Collingswood Farmers' Market Director; Joe Njoroge, COO of the Food Bank of South Jersey; Joan Leonard, Collingswood Commissioner and her husband, Tom, plus many other friends and market shoppers. As an official 2016 Farmers' Market Blogger (one of 6 writers dontcha know! ), I arrived to the market well before the official market opening, in time to not only witness the ribbon cutting, I was asked to take the photos of the occasion. There's such a sense of community and excitement once the Market opens. It means it's the start of something special for Collingswood. People you haven't seen in 6 months appear, kids play and dance to the singers and music makers at each end of the Market. Friends reconnect. You see folks who you recognize only from the weekends appear with new members of their families, new babies, older children, or new visitors awestruck at this special event happens weekly. Joan Leonard, Collingwood Commisioner, with her husband, Tom, to her left in the background. I spoke with Collingswood Commissioner, Joan Leonard, and her husband, Tom, and learned their story of how they came to Collingswood over 20 years ago, first as New Yorkers who crossed the river from NY to Philadelphia, to being "river-crossers" again, moving from Philadelphia to New Jersey. The told me how the community and the farmers' market came to be. It wasn't easy at first, they told me. Skeptics from all of their previous neighborhoods couldn't believe they would move to Collingswood in the early 1990's. Back then you just didn't move to this area. But, they saw the potential in the town. They saw the good bones of the houses and knew that this town could be revitalized. They asked friends to volunteer their time to help rebuild and renovate houses, and soon a committee was formed. From there, houses were renovated and a movement had started. So many great foods, so little time to purchase and photograph it all! When people move to an area, renovate it, create wonderful homes in which to live, it naturally leads to wanting places to dine and shop. And if you are shopping, it leads to wanting to eat. Restaurants began to open. The need for a grocery or local fresh food purveyor was lacking. The idea to bring fresh foods to the community became an integral part of revitalizing Collingswood. The Farmers' Market was born out of this desire. Two new fantastic food finds: Jake's Origin Almond Milks and the Food Bank of South Jersey's Just Peachy Salsa. Having only an hour or so to wander through the Market before I had to head to my day's next event, I was able to chat with a few new vendors and visit with some of my favorite people. 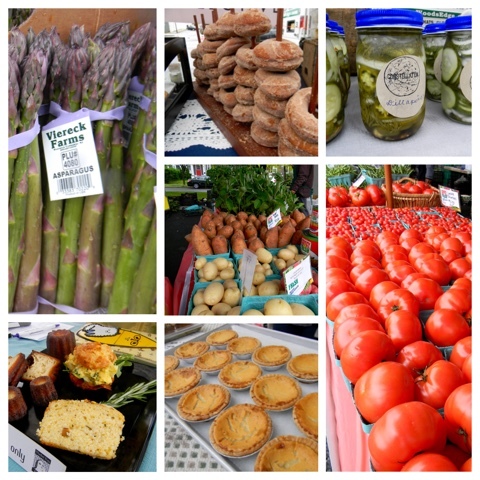 I saw my favorite asparagus, strawberry and tomato vendor, Les, from Viereck Farms in Woolwich Township, NJ; Andy Satinsky from Weckerly's Spruce Hill Creamery Ice Cream; The folks from Springdale Farms. 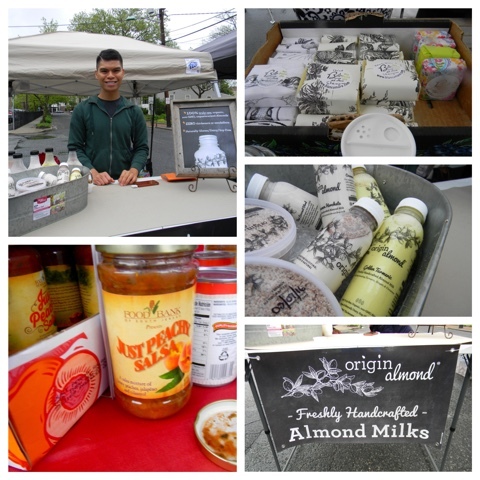 I met new vendors (or sort of new) such as Jake, from Origin Almond, who makes hand-crafted, organic plant milks like Almond, Ginger and Turmeric; Rice Milk Horchata; Debra Di Eva Dulin who has Bianca Del Mare hand-made soaps and cosmetics. 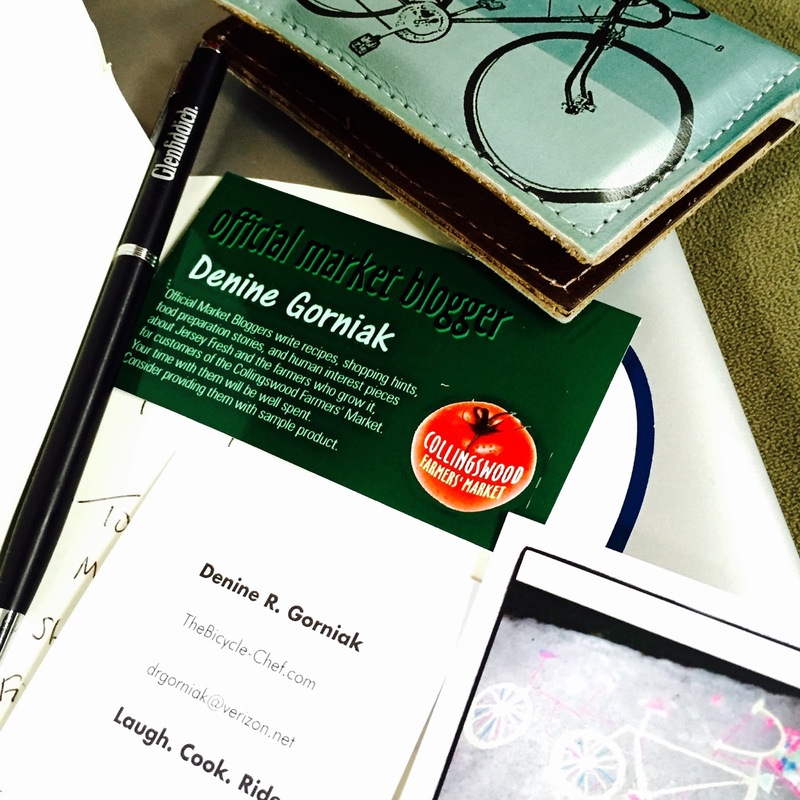 I barely scratched the surface of folks to talk to during my quick walk-about. One new aspect to this year's Market is the Collingswood Bag-Lending Project. Lindsay Thivierge, who is helping Tricia Burrough and The Friends of the Farmers' Market (FOFM) head up the Collingswood Farmers' Market bag-lending project spoke to me about what FOFM are doing this year. 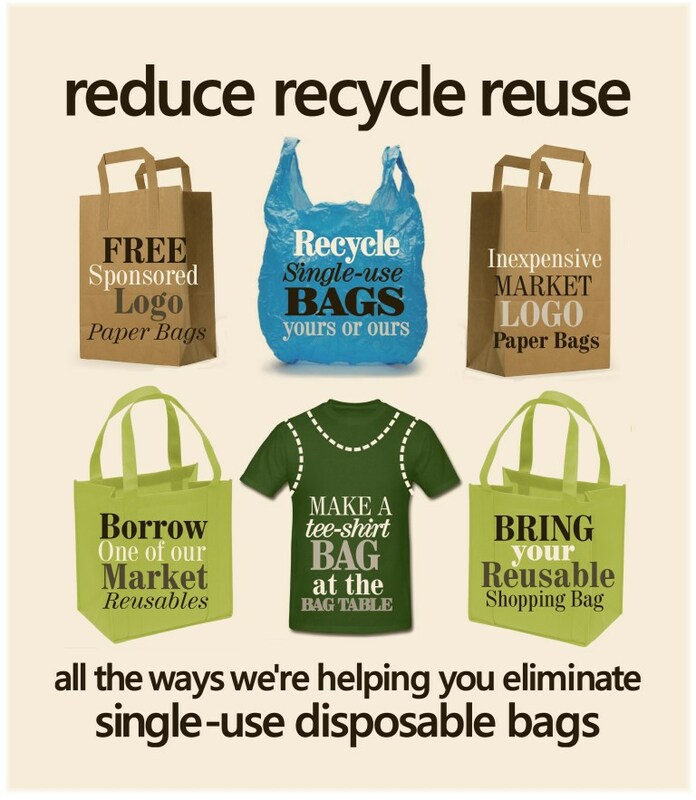 To encourage market goers to use less, or no plastic bags, FOFM have taken on the challenge to make or lend recycled/reusable/renewable bags. The all-volunteer run organization has a sewing machine set up to turn old tee-shirts into shopping totes. One can either make an easy to create no-sew bag, or stitch the bag's bottom. Tee-shirts will be collected and lessons are freely given. 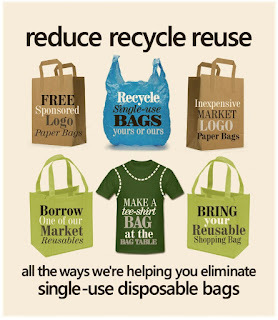 Bags will be lent, plastic bags accepted to share with other market goers who may have forgotten a bag. Feel free to bring your bags, your old tee-shirts and if you have know how to sew, lend your skills on the sewing machine! All locally made and sourced peach salsa. Waste not, want not. Another exciting food development for this year is the sale of the Food Bank of South Jersey's Peach Salsa. This salsa is not only deliciously good, it's good for the environment. New Jersey peaches that were deemed not quite good enough for sale in supermarkets or farmers' markets would normally be taken to be dumped in landfills. Over 200 tons of food that could have been used was being wasted. The economic and environmental impact of this waste was averted by The Food Bank of South Jersey. Partnering with Campbells Soup Company (another local business, with headquarters two miles away in Camden, New Jersey), The FBSJ created a peach and jalapeño salsa that will be sold at the C'Wood Farmers' Market and local grocery stores all over the area. Sales of the salsa benefit the food bank, keep food waste out of the landfills, and create jobs for farmers, pickers, and the FBSJ. It's a win-win business. With so many things to buy, foods to eat, people to meet, I can tell I'm going to have full and lively Saturdays all season long. Spring is here! Fun is here! Come here to Collingswood, It's Where You Want to Be! Factual error, Denine. Lindsay Thivierge does indeed run the "Make Your Own Bag" operation, but she's not at all part of the Bag Lending program. Tricia Burrough and the Friends of the Farmers Market (FOFM) are responsible for the Lending Program. Doh! Got it David! I made the correction and my appologies to FOFM and Tricia Borough for the oversight! Thank you, Denine. You're batting well over .900! We caught this one before the link shows up on the email blast. Whew! so glad I saw your tweets and comments so I could make that correction. It's worse for me as I'm eating so clean these days that even photos make me shaky! Ha! I do love the desserts but with my elimination diet, they are a strict no-no. Thanks for the comment and compliment!